There has never been a bonafide Monkees Christmas album, only a few scattered Yuletide songs by assorted Monkees over the years. The Monkees Christmas Party is the first album with brand-new recordings by Micky Dolenz, Peter Tork and Mike Nesmith, plus two previously recorded songs by Davy Jones from his private label. Like their other recent release, Good Times, the production is first-rate and reminiscent of the joyous zany days of color TV and comic hijinks. A Christmas album makes this sort of thing a natural—even though Davy’s lovely tracks, the Bing Crosby classic “Mele Kalikimaka” and the string infused “Silver Bells” invite a feeling of melancholy for our loss friend. If I were to pick one song for hit status, at least in the U.S., hands down it would be “I Wish It Could Be Christmas Every Year.” Launched by the British glam rock band Wizzard in the UK, it is a standard there—and probably well known especially to Micky, who lived and worked there extensively. The song is a standard on English TV, radio and records by everyone from the Spice Girls and Kylie Minogue to Sarah Brightman and Max Bygraves. It was even played on an episode of Doctor Who. But while a few American artists have recorded it, the song has never caught on here. It’s just the thing for The Monkees to take to the top. In addition to the 13 tracks, there is a special Target edition with two more archival tracks. One is a 1976 single recorded by Davy, Micky and Peter called “Christmas is My Time of Year.” The other is the beautiful a capella carol “Riu Chiu’ from the TV soundtrack of the original Monkees series in which they had to convince a cranky kid (The Munsters’ Butch Patrick) that Christmas was groovy. These two songs were released on other CD’s: “Christmas is My Time of Year.” on a Scotti Bros album called A T.V. 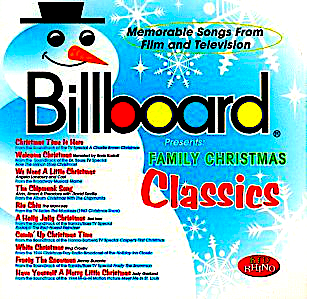 Family Christmas and :Riu Chiu” on an album I produced for Rhino Records called Billboard Family Christmas Classics, which was the first compilation of songs from holiday specials and movies in one album, though there were many after this one, and they were very good too (I bought them all). Amazon has The Monkees Christmas Party CD here.